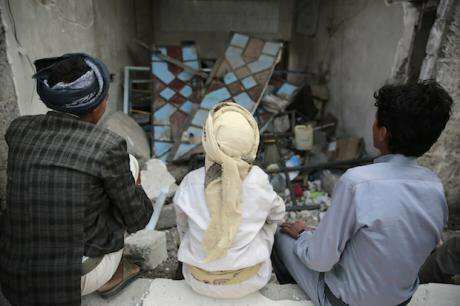 Boys sit on the rubble of a two-floor building after it was allegedly destroyed by Saudi-led airstrikes on the northern outskirts of Sanaa, Yemen, 23 August 2017. Picture by Hani Al-Ansi/DPA/PA Images. All rights reserved.Today, conflict in the Middle East is reduced to Saudi-Iranian rivalry. The story is that emergent Iranian hegemonic designs in the Levant pose a threat to regional peace that needs to be countered. The narrative is cast as religious ‘Shi’a v. Sunni strife’ for additional existential effect. However, this simplistic frame obscures a more significant development: the return of authoritarianism to the Middle East. Autocratic rule is consolidating in Saudi Arabia, Turkey, Egypt and Iran alike. It is overlaying the causes of the Arab Spring - a lack of bread, freedom, social justice and human dignity – with new waves of repression. This realization is insufficiently reflected in western foreign policy that is dominated by concerns over radicals and refugees. Yet, the mix of domestic repression and foreign neglect stores up conflict for the future. It also runs the risk of simply repeating history. The short of the matter is that these four key regional powers are – to varying degrees – autocracies, which means they can pursue their foreign policy objectives without much regard for their own people, let alone others. The smoldering ruins of Syria demonstrate what can ensue. They are in large part the result of regional powers fragmenting the civil war by supporting different proxies. So far, the conflicts between powerful rulers - Mohammed Bin Salman, Recip Erdogan, Ali Khameini and Abdel Fattah El Sisi - have largely taken place in the weaker states of the Levant, i.e. Lebanon, Syria, Iraq and, at the periphery, Yemen. The forced resignation of Prime Minister Saad Hariri of Lebanon was only the latest twist in this saga of proxies, politics and patronage. Yet, these battlefields interact with sites of conflict located inside the regional powers –Kurdistan in Turkey, the Sinai in Egypt and the Eastern Province of Saudi Arabia - in ideological, human and/or material terms. The unresolved Palestinian case also remains a potent conflict catalyst. In short, more ‘Syria’s’ cannot be excluded. Four-way autocratic competition has temporarily given way to an Iranian-Saudi face-off because Egypt and Turkey are preoccupied at home as internal violence followed their authoritarian consolidation. While Iran and Saudi Arabia are embroiled in a classic realist geopolitical competition - instrumentalising identity and religion for political gain – research suggests that Iran is less dominant than typically assumed, while Saudi Arabia is not the modernising society it pretends to be. As a result, the emerging unofficial partnership between Israel, Saudi Arabia and the US as ‘balancing act’ against Iran, the Syrian regime, Hezbollah and some Iraqi paramilitary groups not only risks fighting the ‘wrong’ conflict, it also exposes the Middle East to a greater conflagration.